here you can ask for further support. Please describe your problem as best as you can, "I cannot view your videos" will not help us solve anything. Hi. I've just started studying animation and need some help. Maybe you can answer this question. I must make cycled IDLE animation to spaceship for game engine - floating up and down. 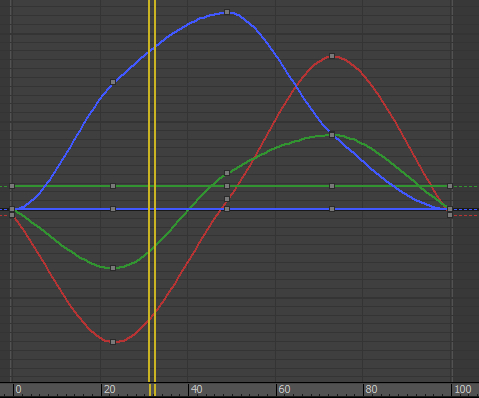 I tried to make start position from center of animation and got two key frames in the middle position. It making stairs effect when animation repeating. I solved it by choosing start animation from the lower position(which get start and end key too) and for the upper position setup two frames, but got a little offset for original position of mesh. Some engines solve it by blending animation... but maybe there is a way to make start position from the middle(original position of mesh) ? Sorry if this is not right place for asking it. what program aree you using? 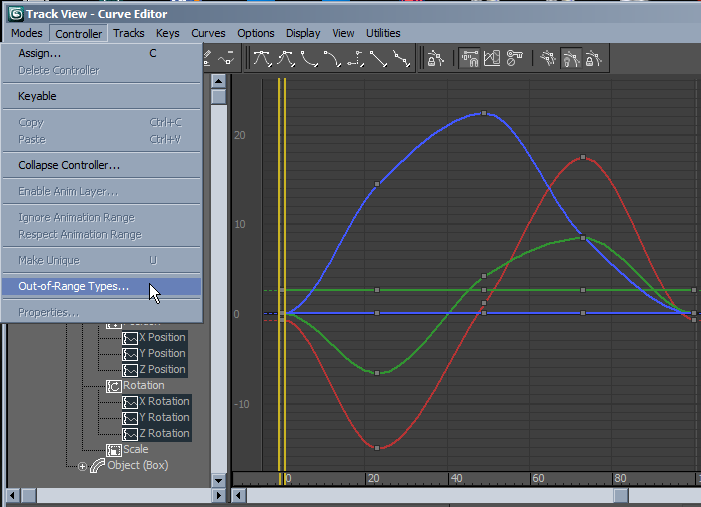 does it have a curve editor were you can see a curve diagram of each movement axis over time? 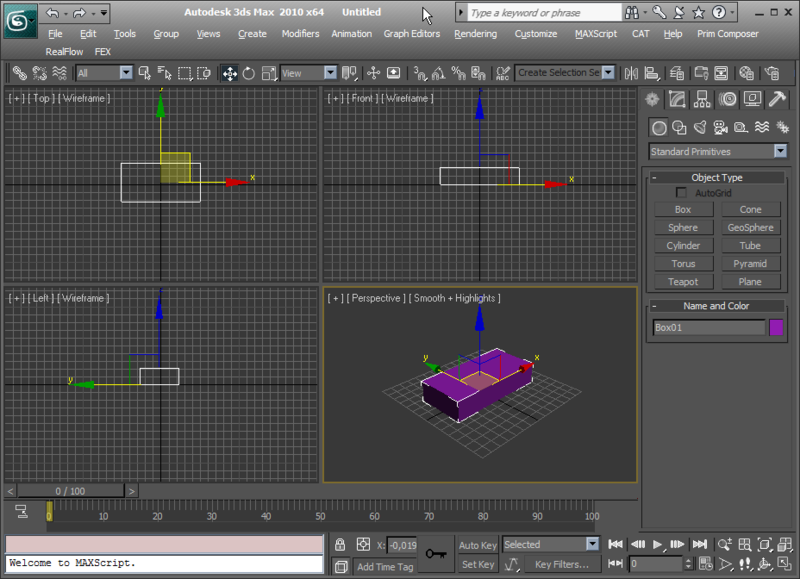 I'm using 3ds max. 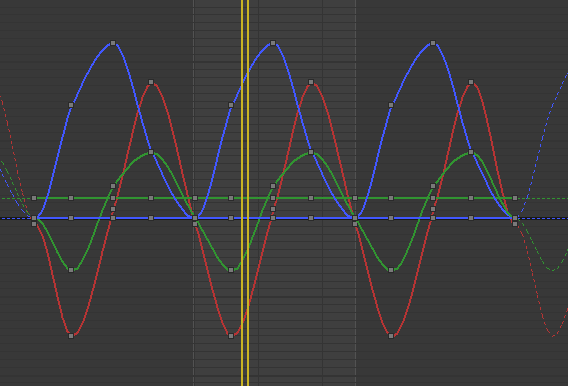 You want to say, that fixing of certain channel in curve editor can solve this problem? Lets say I have a scene without animation. and Shift+Drag those keys to the end of the animation. Then do the animation in between those keys. Here is a simple animation. You now have a looping animation, but it looks odd, more on this in the next post. 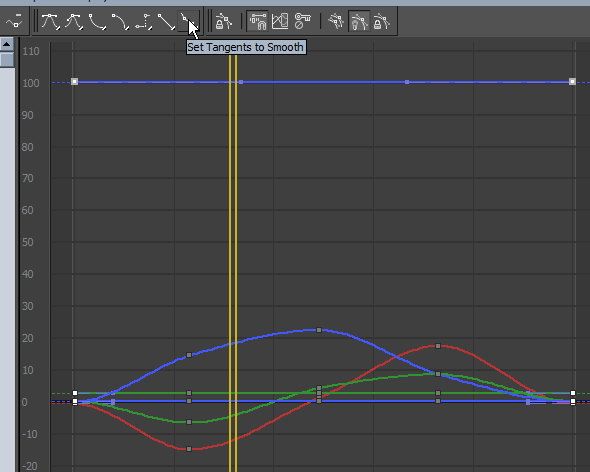 Next I would go to the Curve Editor to check out whats wrong with the Animation. 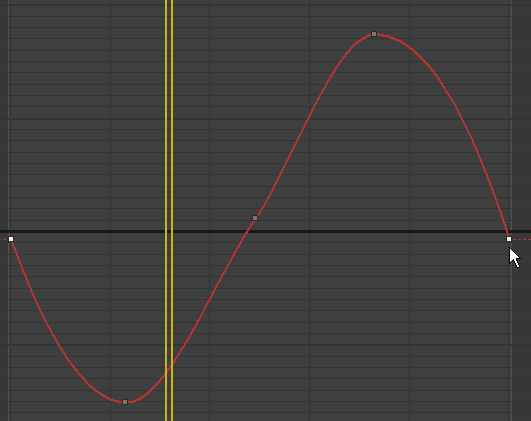 How did I get those lovely dashed curves to the left and right of the animation? 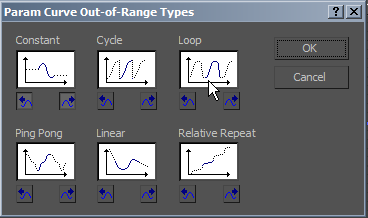 With the rotation and position controllers enabled go to "Out of Range Types.."
This will create a loop of the keys you have created, if you had animated frame 0-10 it would loop those 10 keys over and over throughout your animation. But I am only using this to show the effect of the curves right now. 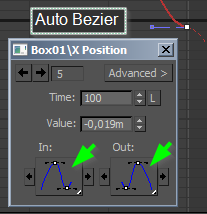 If you right-click one of the keys you can see they are set to Auto Bezier. This is the standard for new animations and its usually quite good. 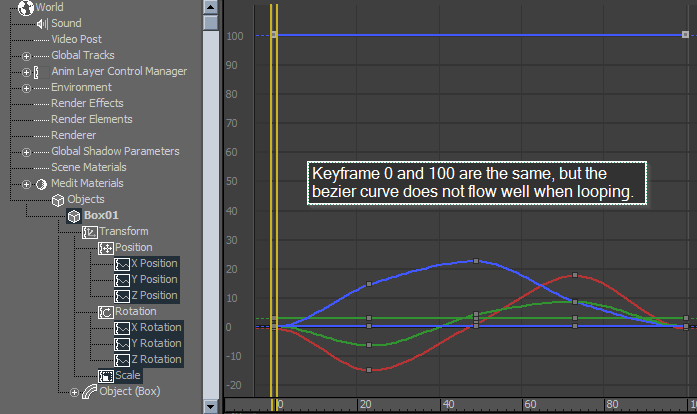 However, the Auto Bezier doesn't know we want to loop to frame 0. 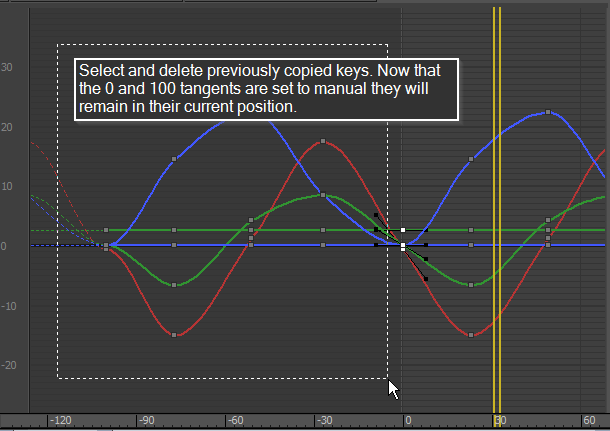 Select all keys of frame 0 and 100, and "Set Tangents to Smooth"
This will create a curve that won't stop movement at frame 0 and 100, it is however not precise looping. This may seem a bit complicated, but I think it's worth it. Select all keys of your animation. 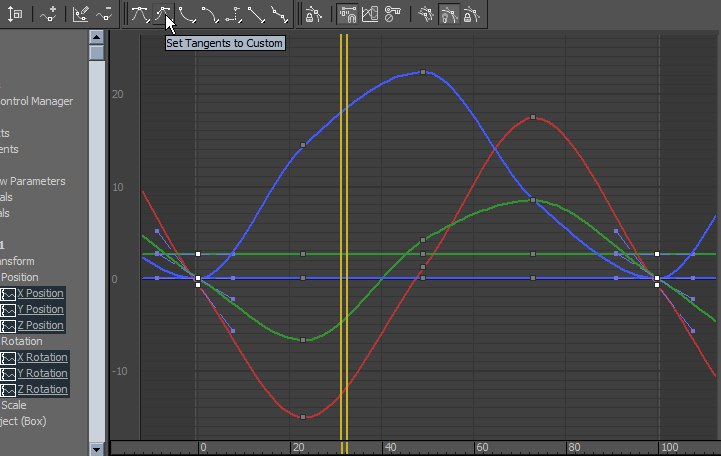 Then Shift-Drag a copy of all keys to the very left and right of your Animation. In this case we would copy the keys 100 frames to the left and 100 frames to the right. 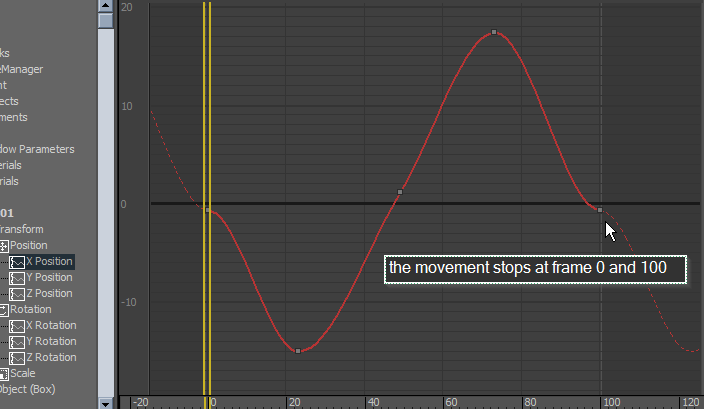 are now aware of the looped animation and will do a correct smoothing accordingly. 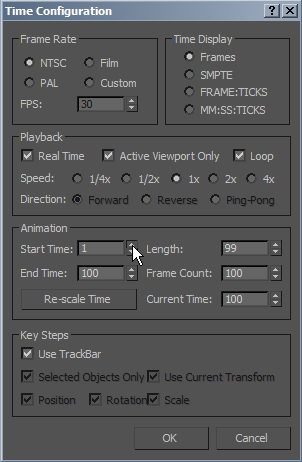 Select all keys at frame 0 and 100 and "Set Tangents to Custom"
After we deleted the extra keys we end up with a perfectly looped animation. But remember, frame 0 and 100 are the exact same frame, if you were to render this out you would have two frames after one another. This would create a short visual lag that may be noticeable with fast animations. and set your Start frame to 1. 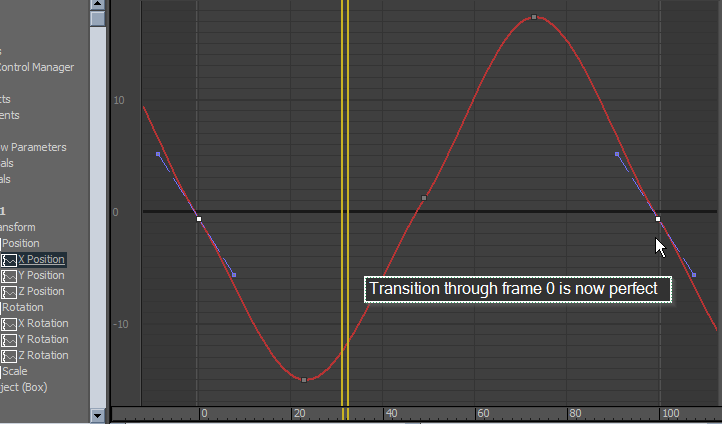 You can of course just render or export one frame less, but its easy to forget this later on. Wow, great answer, both methods are good ,thanks. This is exactly what I needed. 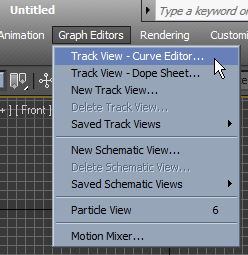 I thought that curve editor is quite useless thing for such type of tasks and this can be solved by right shifting of keys. Now I understanding much more. I met another problem. How can I make animation of turret blow-back or lifting leg, when bones have hierarchy? They can only rotate or scale. Taking commission, having 8 hour of tutorial experience, was not the best idea :) , but few animation already approved. Thanks god I refused from character animation. I'm writing this on my phone, so no pictures. Yes, taking commisions was a bad idea at this stage. Don't use bones with ridgit geometry, you can link together any object you want and you will be able to move them. You can also link an object to a bone and it will be able to move. I only use bones when I am dealing with objects that need to be deformed with skin modifier. If you need the object to rotate arround a certain point, you should move the objects Pivot during setup. If you really need to use bones, there is a "bones tool" in the character menu. there you can setup certain things like stretchable bones. I'm doing things for UDK engine - single mesh and bone setup needed. Thanks for advise. I'll try to dig in this direction. I had another look.. the menu I was talking about is under "Animation/Bone Tools.."
if you uncheck the "bone on" check-box you should be able to move the bone like a normal object in a hierarchy. Yes, this is that I looked for. You saved few hours of sleep for me :) Thanks.